We address the dangers and health hazards of kerosene lamps and provide valuable hours of additional light so families are healthier, students can succeed, social bonds are strengthened, and farmers can get valuable market information. 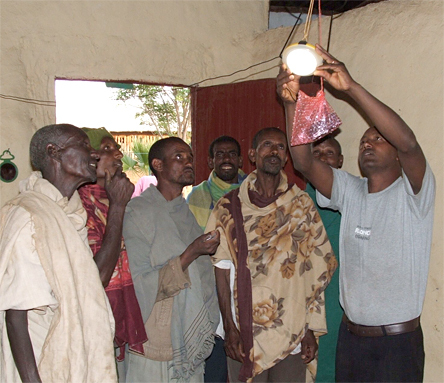 In nearly all the villages served by Project Ethiopia there is no access to an electrical grid. Families must rely on dangerous and costly kerosene lamps that generate toxic fumes and pose significant health risks such as lung and eye diseases. Solar-powered lanterns, on the other hand, provide twice as much light as kerosene lamps and have an immediate impact on family health and community well-being. Once in place the lantern costs very little to operate, making it an efficient and renewable source of energy. Our lanterns also have the capacity to serve as a charging device for cell phones. In the rural areas in Dangla as in many other areas of the developing world, communications technology has bypassed fixed land lines in favor of cell phones. This added feature creates improvements and opportunities in the areas of health, agriculture, and education. Farmers can plan their future marketing by phone cutting out the middle-men who encourage selling crops at harvest time when prices are low. 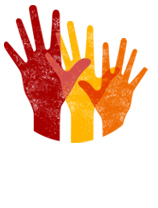 Partnership with the community is fundamental to every project we operate. In the case of solar lanterns, families are asked to prepare their main living area by reapplying the mud/straw plaster and smoothing the walls. Upon completion, Project Ethiopia workers will come and apply several coats of white paint. When the solar lantern is presented, the improved and painted walls will help maximize the lantern ’s illumination and be a source of family pride.